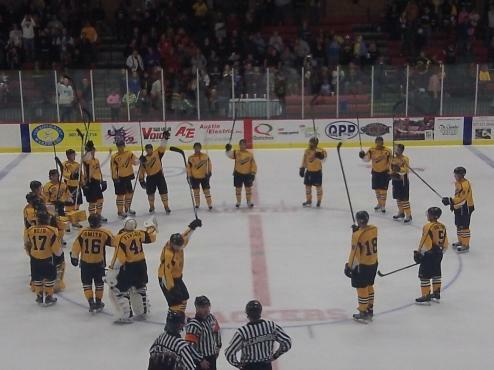 The Austin Bruins were back in action to battle the Expansion rival Aberdeen Wings. Austin entered the tilt with a 15-4-3 record over two seasons. Aberdeen came out strong in the first frame as they took a 1-0 lead early. The Wings took a 2-0 lead when Peter Krieger found the back of the net. The Bruins had plenty of chances in the first period throwing 15 pucks on Marcus Zelzer . At the first intermission Austin trailed 2-0. The second period the physical play really picked up. Nolan Kirley fought Tommy Miller and gave the Bruins the much needed momentum with the victory. The Bruins were able to cut the lead in half with a Riley Colvard goal that was unassisted. The Bruins tied the game at two with a shot from Cody Dixon assisting was Chris Fischer and John Simonson. At the end of two periods the game was tied at 2. The third frame the Bruins added a power play goal just a couple minutes in. Brandon Wahlin was the goal getter the assist went to Cody Dixon. The lead did not last long as Aberdeen was able to slide one past Nick Lehr. With the score 3-3 Riley Colvard did it again, assisting was Brandon Wahlin. The Bruins continued to grind as John Simonson put in his own rebound the assist went to CJ Smith. The Bruins pick up their second victory in a row with a 5-3 win in front of 1389 fans. Austin will wrap up the two game set on Saturday. If you can’t make it to Riverside Arena you can listen to the broadcast at AM 1480 KAUS. Puck Talk will start 6:00 pregame will start at 6:55.